We have today launched our biggest giveaway to date! 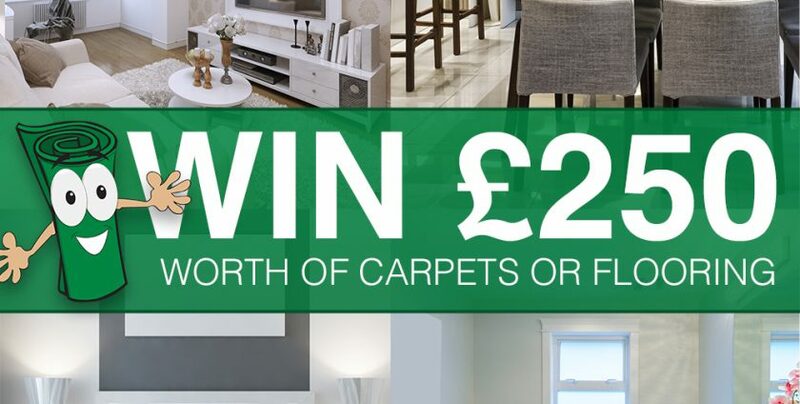 We’re giving you a chance to win £250 off any carpet or flooring. All you have to do is let us know what room you would spend £250 on. ‘Like’ us on Facebook and comment on the picture with what room you would spend the £250 of Carpet or Flooring on. The ‘Karpet Kingdom £250 Giveaway’ competition (the ‘Competition’) is open to UK residents aged 18 years and over excluding employees and fitters of Karpet Kingdom (the ‘Promoter’) and their affiliates or agents and their families. To enter the Competition, entrants must have internet access and a Facebook account. Participants must “like” or have previously “liked” the Karpet Kingdom Facebook page. To enter the Competition, entrants must live within a 20 mile radius of a Karpet Kingdom store. Fitting of Carpets or Flooring isn’t included. Contestants must comment on Karpet Kingdom Facebook page what room they would spend the £250 voucher on. The Winner will be selected at random at the end of the Competition, notified by Facebook message within 48 hours of selection and named on the Karpet Kingdom Facebook page. The first person selected at random will receive £250 to spend at there local Karpet Kingdom store. Winners will be required to take part in post event publicity. The Promoter reserves the right to select an alternative winner if the prize is not claimed within 28 days of notification. The Promoter reserves the right to substitute prizes with items of equal or greater value in the event of unavailability due to circumstances beyond the Promoter’s control. In order to receive prizes, entrants must provide address details to the Promoter. Personal details will not be passed on to third parties. No purchase necessary. A purchase or payment will not increase an entrant’s chances of winning. Only one entry per person for the entire competition period. The Promoter may disqualify an entrant if the entrant acts with intent to annoy, abuse, threaten, or harass any other entrant, Promoter, or Promoter’s agents or representatives. Competition entry closes 30th April 2018 entries received after this time will not be considered.